Hi to all of you Mrs. to Mama readers. I feel so honored to be able to take over her blog for the day. I was tickled when she asked if I wanted to do a Guest Post on her blog. I was actually more than tickled, I may have screeched, for she is one of my favorite blogs in bloggyland. I'm Summer over at Summer's Story. You can find me at http://summer-summersstoryafamilysjourney.blogspot.com. After emailing back and forth with Becky and talking of how super considerate she is asking of me while just having that uber precious bundle of Graham of hers, a light bulb went off and I found what I could Guest Post about. I thought it also went with her just having a baby as well so here it goes my Guest Post today is on BABY GEAR. IF YOU ARE RINGING IN THE NEW YEAR WITH A NEW BABY HERE'S MY SUGGESTIONS FOR BABY GEAR! So lets get started shall we. Now please take in mind these are just the items and essentials that got us through the newborn stage. Every momma and every baby is different. I know for one I am not an expert by any means lol, but I find it fun to share and compare of what worked and didn't work for us and for you. Here is a list of the survival items that got us through the newborn stage and kept Kelcee as happy as can be. Eddie Bauer Play yard/Bassinet/Changing table combo: I am so in love with this play yard, so much so I still have it lol! Of course we do not use it anymore since K is six lol but I just can't part with it. It's also nice when friends come over with their babes and we have a place for them to play! When K was born and all our anxities from infertility, being new parents, her being a 36 weeker, having Jaundice, and worrying of SIDS we chose to keep her at the end of our bed in the pack in play for the first three months of her life. What rocked about this one is that is was a bassinet at first which was higher, had breathable netting in case baby would some how move over to the side, had the cutest elephant mobile, had a changing table for late night changes, I mean this to me was just perfection and worked wonders for us. I love how easy it was to close and how the mattress wraps around the play yard for easy transport and we used this on many many trips to JHU when K was two etc. You can just change it from bassinet to play yard in a second flat and wha la! So no need to purchase a seperate bassinet and play yard it's all in one, I'm all about that! I will tell you we loved this so much! Since we didn't know if Kelcee was going to be a boy or girl we chose a neutral pattern, what was so funny is that the hubs would joke we should name her Eddie Bauer since that is what all her items were ha! Sleep Wedge: I was always so worred Kelcee would roll on her stomach and where she was a preimee and had reflux it made me even more nervous so we used this awesome wedge that would keep her sleeping on her side and it was padded and comfortable as well! A win win for us! I highly recommend it for those worry mommies like me lol! Baby Caddy: I don't think I could have survived without this. I kept one in each room and was able to easily get what I needed quickly to make Miss K as happy and comfortable as possible. 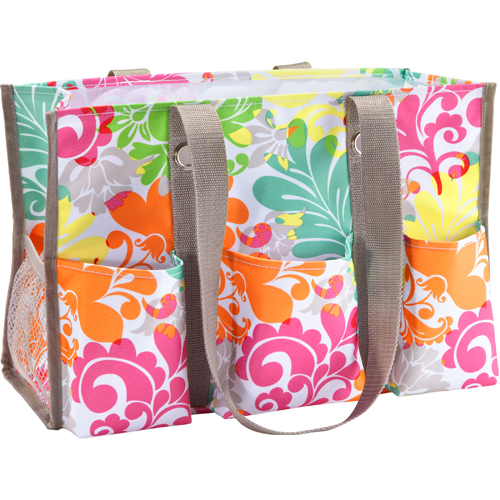 I actually used the Thirty One bags as baby caddy's which worked amazing but they make baby caddy's at Toy's R Us as well! I used the organizing utility totes and mini organizing bins and had Kelcee's name and initials monogrammed on them. I didn't use the below pattern, I was just showing what it looked like lol. (This one is from Toys R Us it is called a Diaper Caddy) I loved using mine so much, so say hello to my little friend. I kept one in every room lol! I put everything I needed to diaper baby in them. I used the thiry one one's but thes are uber cute as well! Desitin Creamy: This was golden to us! I can honestly say Kelcee never had a diaper rash and I do believe that this stuff really helped with that. The hubs said I used so much at times her toosh resembled that of a clown's face ha! Summer Video Monitor: I loved this so much! I was able to see my precious K sleeping while doing chores throughout the house, eased my mind! It didn't hurt the product had my name lol! I also had this Monitor too...yes I had two monitors...I was a very cautious new momma! The Fisher Price Lights and Sounds baby monitor was awesome as well. If baby made as much as a peep it would light up! Love it! Boppy Pillow: Say hello to my little friend! I had three. I remember the hubs getting the first one as soon as I had K to be easier to nurse. Perfection. It also doubles as a place to lay baby and support her head, etc. We loved this product so much and I would recommend it to any new mommy in a second flat! I love the above one that has pockets to put baby essentials. Eddie Bauer Bouncer: This was golden to us when K was a newborn. It has awesome nature sounds to soothe baby, you can set it to bounce just a little and it had a cute little mobile on time to keep babies attention. Kelcee loved this so much when she was born and where she was still to tiny for her swing she really loved this as much as we did! Diaper Genie II: We love love loved this! The newer sleek edition was a lot easier to work and never had smells. Yay! We loved this so much! Pampers Diapers seemed to work best for us and since the hospitals used them we went that route and Pampers wipes seemed to be softest for our Kelcee's touche when she was a baby. As she grew older and messes got bigger we switched to Huggies for they are thicker and absorb more mess. Cradle Swing: Say hello to our little friend! We ended up getting two lol! One at my baby shower my bestie threw for me and one at the hubs work shower ha! We took one back lol but we loved this swing so much! The mobile, the settings, how you can switch it to rock side to side or front to back, just perfection! Love it! Baby Bjorn: This was my go to! I loved having K so close to me and when she was a few months old I remember putting her in it while doing grocery shopping and freeing up space in the buggy all at the same time! When she was really tiny I would use it with her around the house while cleaning bottles, making bottles, etc. I loved it so much and found it so easy to use. A friend loved the Moby wrap and I bought her one when she had her second baby but I was scared I would never be able to figure it out lol! Eddie Bauer 4 in One Travel System: Yes, see the Eddie Bauer trend lol! You don't have to use the Eddie Bauer brand lol, I just love how the system transformed into so many different stages and we still use it. See at first you can use the base and if you have the Travel System Stroller which I did lol, and you can pop the carrier out and wha la its a newborn carseat. As K grew we used it backwards until she was a little over one and met the requirements before we turned her forward without the carrier of course. As she grew we could easily make adjustments to the head rest and straps. The more she grew the more we could adjust and it was really easy to take the fabric off to clean which I absolutly loved and still love about it. Then it went from a car seat to a toddler booster seat and now a child booster seat. So instead of having to buy seperate items you have it all in one SCORE! Here is link. Eddie Bauer Stroller Travel System: Say hello to my little friend. Yes, it was a bit on the heavy side but still very easy to open. I could do it with one hand before I got sick. I loved being able to either put Kelcee's carrier towards me or towards the world, have the awning part that had a plastic peep whole to check on babie but rid from germs and cold, then as she grew the stroller grew with her. We used this stroller until she was a bit over three. Dishwasher Baskets: I love these so much and still use them for straws, small pieces etc. When K was little they were perfect for all the pieces for bottles, sippy cups, little silverware or anything that may get lost or melt in the dishwasher. Swaddle Blanket: We were really funny about having any loose bedding in K's bed. I even took the bumpers out. I was super scared of SIDS and this Swaddle Blanket was the one I loved most and felt the most comfortable with. Baby Einstien Play Mat: This was just amazing for tummy time and the bright colors and all the activities kept babies attention. Some go to books: I always read to Kelcee from the time she was in my womb. I believe it may have something to do with her being able to read books in Kindergarten. I loved reading On The Night You Were Born, I'll Love You Forever, Pat the Bunny, Go To Sleep My Love, Good Night Moon, oh just so many but these are some of our all time favorites and still are! Dreft: I have super sensitive skin and so does newborns and we found this detergent to be the best fit for us! Kelcee never ever had a reaction with it. Newborn Survial Kit as I call it lol! I got this as a gift at my Baby Shower and it is a must have. Comes with brush, comb, aspirator, nail clippers, medicine dispenser, boo boo elephant that you keep cold for those boo boos when they crawl and fall, themometers, I mean this kit is the bomb girls! Medella Breast Pump-I got this pump as a gift from my mother. After I had a minor, ok major incident with the machine, yes girls you must read the directions, or you may just end up with the machine on high and the suctioning cups suctioning so hard you thought your tata ended up inside the machine while screeching for your hubs to turn it off as he is laughing as hard as one possibly can. Yes, that did happen to moi, the one who never reads directions ha! Let's just say after that I always read directions. Once I figured that bad boy out, I was in love with it. It comes with everything you could possibly need and more, it is super quiet, you can adjust the settings to your comfort and it comes in a super sleek bag that looks like a big purse or brief case. For those of you who are breastfeeding or who are going to breast feed this pump is fabulous. Whlie breast feeding Kelcee I used the Playtex bottles with the liners. I have to say it was quite amuzing at first when I tried to gently squeeze the air as it read on the directions from the bottle and one liner busted all over the sink and me. Formula smell is the best perfume you know ha! After three months my supply deminished and I went to formula feeding. I used the Gerber bottles and the Vent-Air bottles which I loved. They help to keep air out of babies tummy and a happy baby is gold. Baby Bottle and Pacifer Steamer: I loved using this and knowing everything was sterile then I would put them on the bottle rack to dry! I could go on and on with our baby gear loves but I will stop at this last one ha! I am so very happy we decided to go with the dresser/changing table combo! We used it so very much and we now use it as a dresser for K! Baby gloves to keep baby from scratching precious face. Changing Pads disposable when you are out and about and have to change baby! Huggies has them and I believe Pampers do as well and they are so handy to have! Multi-Purpose Diaper Bag suprise, suprise I used Eddie Bauer lol but you can use any brand I love the one that had a changing pad in it and you just wipe it off easy peasy! I suggest a multi-purpose any brand diaper bag with a changing pad inside of it. I had the above one for the hubs and I both to carry and then the Vera Bradley one for me to carry lol! I still use it ha it's like an oversize purse now lol! This little guy was so cute and for a mere 3 bucks would turn colors and tell you if baby's bath water was to warm. I loved this little guy! So there you have it girls my suggestions on baby gear. I would love to hear what you loved or what you felt you couldn't survive without during the newborn stages. Do tell. I could go on and on but I will stop here you will thank me later lol! Tough I'm not a new mom, I enjoyed reading this. I think every new mom and mom to be needs to read this. Declan loved the swing and bouncy chair. I had the medella pump but only did it for a week. I hated breast feeding!!! Looking at all this is making me excited for the new baby to get here! I used oh so many of these things - or something similar! =) and still using many!! Great Post! I'm not a mom but I can attest that Eddie Bauer makes some great items to use when you are a mom. I also know that Columbia, and there's another brand, have started making baby backpacks to use as a diaper bag so Dads don't have issues carrying them. That's a clever idea! Thanks Becky for letting me guest post and thanks girls for all the fun feedback! I have really enjoyed this day of resting and reading lol!